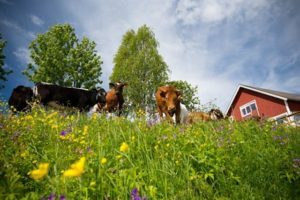 From August 2010, our farm dairy produces ice cream of the milk from our SKB cows, Swedish Culinary Livestock, popularly called “mountain cow”. 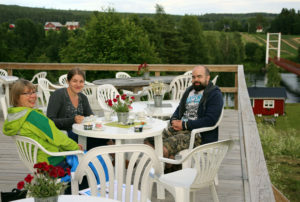 Our Ice cream bar is located in Västra Selet, with amazing views of Vindelälven. In addition to ice cream of all kinds, here are home-baked meals, moderate pies & freshly baked waffles. Ice cream, meat from own farm and other local produce can be bought for anyone who wants to. 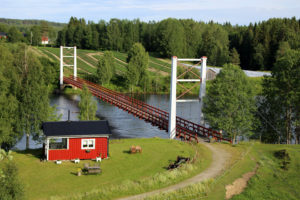 Take a walk along our cow-ladder and learn more about cows or follow the history trail leading down to the suspension bridge and take advantage of local history. A love trail is found in the beautiful pine forest. In the yard it is a child friendly and cozy environment with trampoline and playhouse. Open daily June 16-Aug 19.